Dave’s partner, Pat has asked me to let you all know that Dave passed away peacefully this morning after a long illness. Dave was a gifted sprinter and motivator. His proudest moment was as the last British sprinter to reach the world championship podium, before the modern era. That was his bronze medal in the world amateur sprint championships of 1960. As a motivator and organiser he led the Polytechnic CC dominance of national team pursuiting in the 1960’s which was considered a radical approach at that time by basing his team on sprinters on the basis they all had the necessary speed. He was also proud to be team manager of the track team at world championships. At this time, funeral arrangements are yet to be made but Pat will be advising in due course. Of course we all commiserate with Pat and Dave’s family at this time. My siblings and I learned of our father’s passing this morning through Jackie, our mum, and are genuinely saddened by the news. Please forward arrangements right away to my email address. We remained very close to Nan and Grandad, our Aunt Jean, cousins, Debbie and Tony and the children. We are grieving as would any child losing their father. He is remembered through us and his grandchildren, Robert, Michael, Stephen, Victoria, Patrick, David and Melanie, and his Great Granddaughter, Kailey Alexis, 5 months old, born to Robert and Veronique. The news has been passed on to his best friend of so many years, our Uncle Ray Hutchins, residing in Italy, and here in Canada to our Aunt Audrey Hutchins, and cousins, Simon and Krista. Farewell Dave Handley from Alan and Brian Johnson in Australia. The rider that inspired us to try and ride like like him when in our youth on those race tracks at Welwyn and Leicester. A awesome rider a giant to us. Please accept my sincere condolencies on the passing of your father. Dave was a wonderful guy and as a young man I enjoyed his friendship. 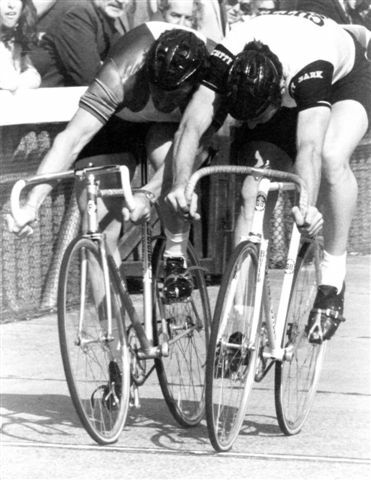 Ray Hutchins and I were members of the Harrow and Rickmansworth CC and later the Silchester CC where we raced together in T.T.s and road racing. This would have been in the late 1950’s. we were also members of the North London enthusiasts car club. I emigrated to the USA a year or so before Ray and Audry left for Canada and we lost touch with each other. I knewyour Mum Jackie and Audrey well, and we were all good friends. I know this is a difficult time for you, but could I ask you to give Ray and or Audrey my e mail address. I have been trying to reach them for many years and this is the first lead I have found. I hope as time passes healing will come. I know how hard it is to say goodbye to love ones, having done so recently myself. Sorry we didn’t come back and read the messages. I know it’s 6 months later but here we are. We don’t have your email address but you can reach me at Rachelsebben99@gmail.com and I will get you in touch with mum and Audrey. A time to remember a brilliant cyclist and ambassador of our sport. Dave was an inspiration to us all in the Poly CC and very respected by all in the racing fraternity. He is in my Hall of Fame and will not be forgotten. My condolences to his family and close friends. Be very proud of his achievements. I first met Dave at work, we were both working at Sperry Gyroscope in Bracknell, myself 1976 – 84. He spotted my bike ( I cycled to work) and started speaking to me. Although much younger than him ( by 16 years !) I know immediately who he was. He gave me much advice and allowed me to tag along on some of the early Southeren Centre of Excellence rides he organised.He could be very forthright, it didn’t bother me but did bother his bosses at Sperry!! I left Sperry in 1984 and went to work near Reading, still riding to work. I often saw him, going to or fromwork, by then he was into big motorbikes! Until a few years ago I occasionally bumped into him in the local Tesco. I would loved to have attended the service but didn’t know he had left us until I got back from a holiday in the Canaries — late on 3rd April. I was just looking for David Handley through Google, and I came across this. Sorry if I have made a mistake but is this the same Dave that I used to know at Sperry/BAe in Bracknell who used to cycle and motorcycle and drive a Citroen 2CV. I new Dave very well at BAe and stayed with him on a motorcycle vacation in France. It has been many years and I had lost touch. I live in the US now and was shocked and saddened to read this..
Have just stumbled across this website. I met Dave when I was an apprentice, spending some time attached to a factory on the Western Avenue, Park Royal. I was then about 16yrs old and a keen cyclist. I was encouraged by Dave and soon joined him for training sessions before work. He was living near me (I was in South Harrow) and used to wait at the junction of Eastcote Lane and Carlyon Avenue for him to appear and I had to join him in a 25 mile sprint to work. He encouraged me and I was soon joining in his Club activities (seem to remember meeting somewhere near Northolt Park station) and racing at Slough and Paddington tracks. I gave up when I moved overseas. So sorry to hear the sad news – he really was an inspiration. Just found the news of Dave ( just found this on the web ). I and my mates from Abercorn Crescent ( round the corner from Hillside ) used to bash around harrow with Dave who was a fantastic sprinter ( used pedestrian crossings as finish lines shouting Prima. These were happy days in the late 40,s and early 50,s. I am 81 years old now living in Fareham Hants and still cycling. Found this by chance.My pal Graham Bennett and i were great schoolboy fans of Dave.always rooting for him in his battles with Lloyd Binch,Karl Barton and Don Skene.As 2 16year olds we went on a great adventure,on our own,to Zurich in 1961,hoping to see him win the world title.Alas it wasn’t to be,but the memory of his first round win,on the inside of Piet van der Touw(all elbows) and Patrick Sercu,is still vivid even now. Saw him with 3 tandem stokers,Eric Thompson,Roger Piggins,and big Pete Carter ,this probably encouraged me to get a tandem which my partner and i still ride after 45 years. Thanks for the memories Dave.